The Center for Arts in Natick and Walnut Hill School for the Arts are pleased to announce a collaborative partnership to produce the first annual MetroWest Student Film Festival, featuring the work of talented students from the cities and towns of Boston MetroWest. Official public screening dates for finalists are scheduled for April 5-7, 2019. 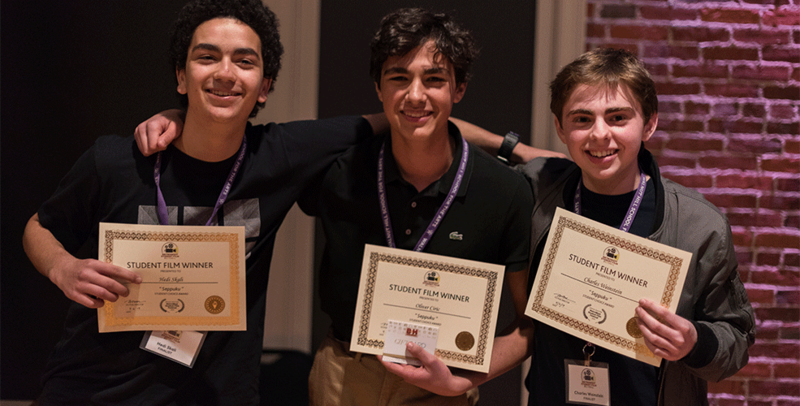 The First Annual MetroWest Student Film Festival will take place in Natick, MA at The Center for Arts in Natick, 14 Summer Street, Natick, MA 01760. Official public screening dates for finalists are tentatively scheduled for April 4-7, 2019. The following rules govern all film submissions to the MetroWest Student Film Festival (“MWSFF” or the “Festival”). All filmmakers must be between 14 - 19 years of age at time of submission and be a resident of MetroWest residing or attending high school in one of the following 32 cities and towns of Massachusetts. Submitted films must be original works and filmmakers must be able to provide proof of permission or licensing for any copyrighted materials, music, and/or actors featured in the project to be eligible. Proper on-screen credit for licensed work is also required. Submitted filma must have been produced within the last two years at the time of submission. Filmmakers may submit a maximum of two film entries. Films must utilize non-professional, unpaid actors and production crew only. Film entries will only be accepted using the platform filmfreeway.com. A parent or guardian name and email address must be provided on each entry form. Parent or guardian will receive correspondence regarding the Student Showcase and Awards Night information. Filmmakers must be available to attend the Showcase and Awards event held at the The Center for Arts in Natick (TCAN) on Sunday April 7th. All films must be submitted electronically through filmfreeway.com. Other means of submission will not be accepted. Incomplete applications or submitting materials that do not adhere to our specifications (see below) will disqualify your entry. NO EXCEPTIONS. All entries must be produced within good taste and fit into a rating category of G, PG, or PG-13 as outlined by the Motion Picture Association of America (MPAA). Excessive violence or other excessive and/or gratuitous content may disqualify your entry from competition based solely upon MWSFF’s discretion. All entries must credit the whole production team individually and be clear about the role each team member played in the film making process. Films must not exceed 10 minutes in length, including credits. Submitted films must be headed and followed by an appropriate amount of black screen (at least 5 seconds). All non-English language films must have English subtitles. 3D stereoscopic films will not be accepted. Films in this category will be judged as a whole project based on the use of live action techniques - films must include only real people and animals, real sets and scenes and no models or images that are drawn or produced by a computer. Films in this category will be judged as a whole project based on the use of documentary techniques - they should be nonfictional and intended to document some aspect of reality, primarily for the purposes of instruction, education, or to provide a factual or historical record or report. Films in this category will be judged as a whole project based on the use of animation techniques - films can include individual drawings, paintings, or illustrations photographed frame by frame (stop-motion cinematography) or generated by a computer (2D or 3D), they can also include motion graphics or stop-motion techniques using models or cut-outs. The films in this category will be judged as whole project and chosen specifically by students in the Writing Film & Media Arts Program at Walnut Hill School for the Arts. A Film Committee shall be convened of filmmakers, film enthusiasts and film critics from the Massachusetts area. No Film Committee representative shall be affiliated with an educational institution represented by an entry. All entries will be reviewed in their entirety by members of the Film Committee. Films will be reviewed and judged by the individual members of the Film Committee using a standard scorecard. After the final deadline the Committee will review the total scores of all the films in competition and select final films from a group of the top scorers. The film committee reserves the right to change a submission’s entry category when appropriate to do so. Filmmakers will be notified of the selection or non-selection of their film digitally by email using the email address provided on the entry form so please ensure that your email address is accurate on your application. Accepted filmmakers will receive complimentary tickets to attend the public screening of their entry in the film festival and the final Festival Showcase on April 7th. By accepting inclusion in MWSFF, the filmmaker grants non-exclusive rights to showcase their film in as many screenings as required. This includes the competition screenings and the festival showcase. In addition, MWSFF has non-exclusive rights to repeat the showcases for fundraising purposes. All gross proceeds from ticket sales and concession sales are exclusive property of MWSFF/TCAN. All selected films may be excerpted for publicity purposes. MWSFF reserves the right to promote any film or script to print, broadcast or internet media as required to market the Festival or TCAN. Submission of 2-3 publicity/production photos and filmmaker headshot are highly recommended. MWSFF is not responsible for incorrect wording in publications or on awards if the entry form is incorrect or illegible.